The Mansion House, Princes Street is a town house built in the late eighteenth century by banker John Hutchings. Watt's map of 1806 shows the property as belonging to John Hutchings Esq. with its rear gardens adjoining the Sheep Fair. At this time North Lane was known as Sheep Lane. The main house is of cut and squared local stone with Ham stone dressings under a Welsh slated roof behind a low parapet and between coped gables. It has a two-storey facade of three-bays, the entrance being in the right-hand bay. The door surround, seen at left, has attached Roman Doric unfluted columns supporting a plain entablature, which flanks a keyed semi-circular arched doorway. Late nineteenth and early twentieth century extensions sit either side. There is a Ham stone string course at first floor level, and a dentilled cornice. Edward Genge ran a school in Mansion House but he died in 1825 at the early age of 25. George Rossiter carried on the school when he married Genge's widow, Grace in 1826. E Watts' map of 1829 notes the property as "Mr Rossiter's Premises" and in the 'Academies and Schools' section of Pigot's Directory of 1830 George Rossiter's "Gentleman's Boarding Academy" was listed at Mansion House. James Morse, a member of the Yeovil Freemasonry Lodge of Brotherly Love from 1828, took over the school after Rossiter's death by marrying his widow Grace. Morse ran the boarding and day school he called a 'Classical, Mathematics, English, French and Commercial School'. 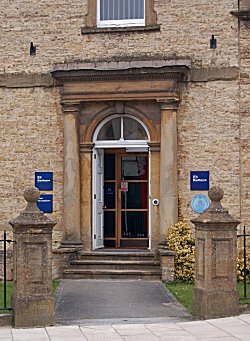 He advertised his school in the Somerset Gazette Directory of 1840, the June 1843 edition of the Sherborne Journal and in a July 1849 edition of the Yeovil Times. His classes also included the likes of land surveying and cartography and there were weekly lessons in chemistry by a visiting tutor for the agricultural students. 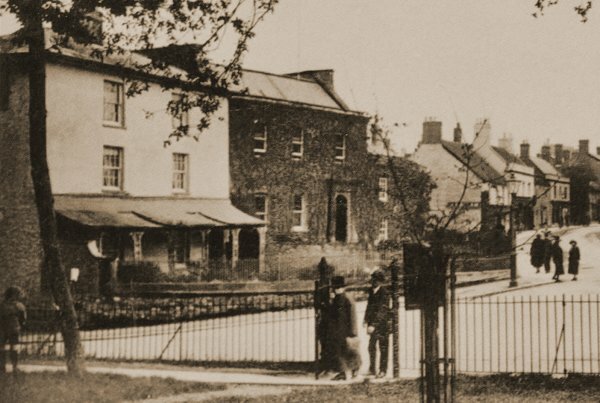 In the 1851 census 47-year old Taunton-born Morse was listed as a schoolmaster and was living in Mansion House with his wife Grace, ten years his senior, her two children from her first marriage and their daughter, Dinah. Also in residence was a teacher, Charles Green aged 21 and three domestic servants. Additionally there were 23 resident pupils. According to the 1846 Tithe Apportionment, Mansion House was owned by Susan Collins, James Morse was the tenant. In the 5 January 1854 edition of the Sherborne, Dorchester and Taunton Journal it was noted that Mr Morse was re-opening the school on 18 January. However in the 18 May edition of the Journal it noted that Morse was vacating Mansion House and relocating at Fullands House, Taunton. In the 1875 Post Office Directory Henry Shortland and Sidney Watts, solicitors, were listed at Mansion house. They were also listed here in the 1882 edition of Whitby's Yeovil Almanack Advertiser. 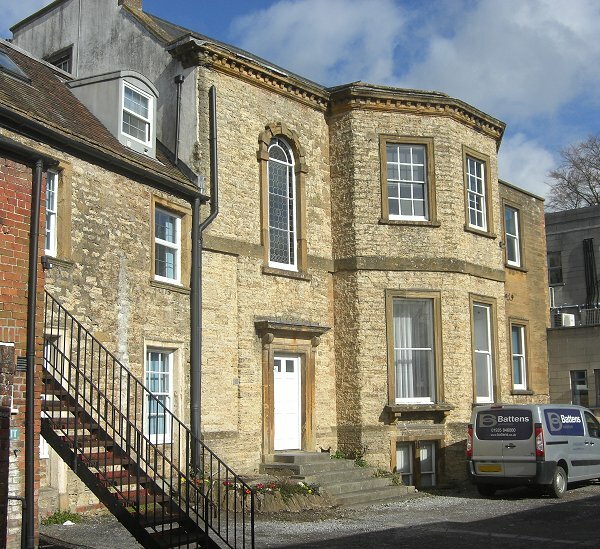 It was subsequently the residence for some forty years of Yeovil solicitor Sidney Watts (who donated Sidney Gardens to the town) and was mayor from 1893 to 1897 and again from 1901 to 1902. It was offered to him by the Town Council as a mayoral residence but was declined on the grounds of expense. In Whitby's 1898 and 1903 editions Sidney Watts was listed as a solicitor at Mansion House. 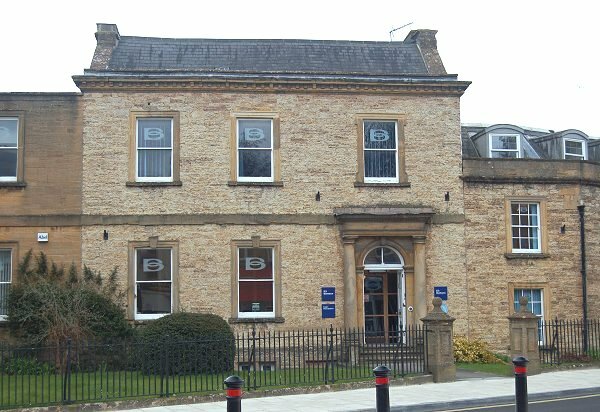 In the 1935 edition of Kelly's Directory, Mansion House was listed as the headquarters of the British Legion (Yeovil Branch) Club Ltd. with solicitors Watts, Moore & Bradford in the adjoining extension now called Magnolia House. In the 1954 edition of Edwin Snell & Son's directory Mansion House was listed RE Clare, accountant, and Mike Loveless, turf accountant. Watts, Moore & Bradford were still in the extension together with accountant FA Hoare. Ford's Directory of 1964 listed Eagle Star Insurance Co. Ltd and Mike Loveless, Commissioning Agent (I've never heard a bookie called that before!). 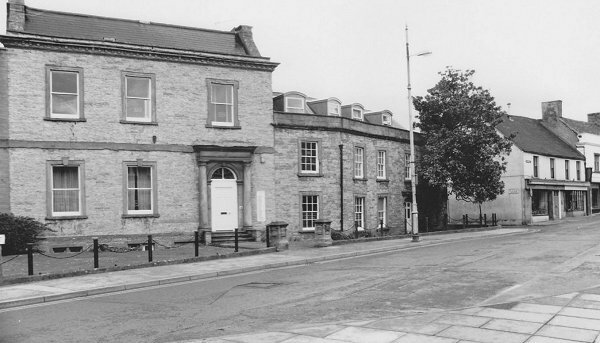 By the time of Kelly's Directory in 1968 Mike Loveless & Sons Ltd, turf accountants, were occupying the whole of Mansion House with Yeovil Insurance Brokers Ltd., the Commercial Union Assurance group and the Northern & Employers' Group in Magnolia House. 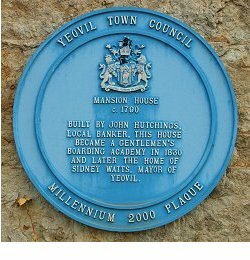 In the Kelly's Directory of 1974 Mike Loveless occupied Mansion House and Yeovil Insurance Brokers occupied the extension. By 1992 Denton's Directory listed solicitors Clarke, Willmott & Clarke as occupying both Mansion House and the extension. 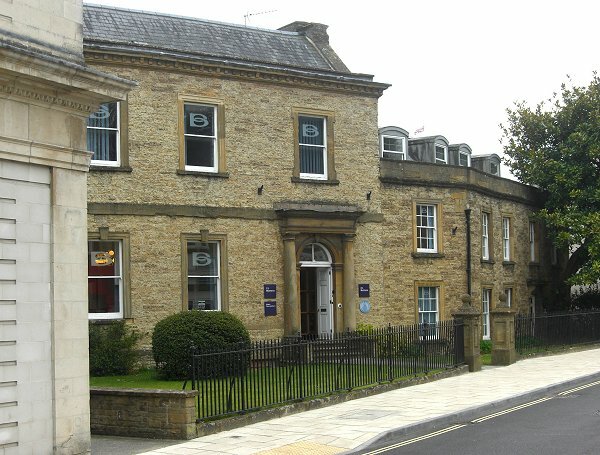 It is now occupied by Battens solicitors. 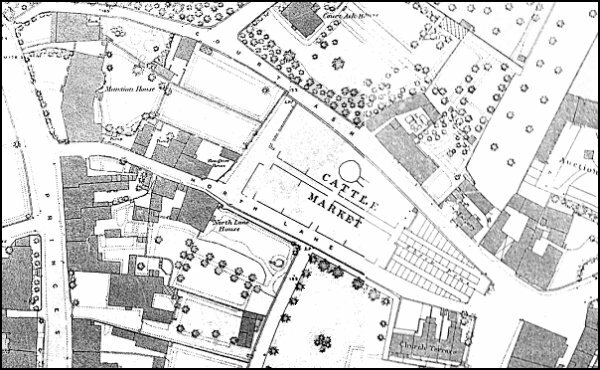 The 1886 Ordnance Survey showing Mansion House at top left, on the corner of Princes Street and North Lane. 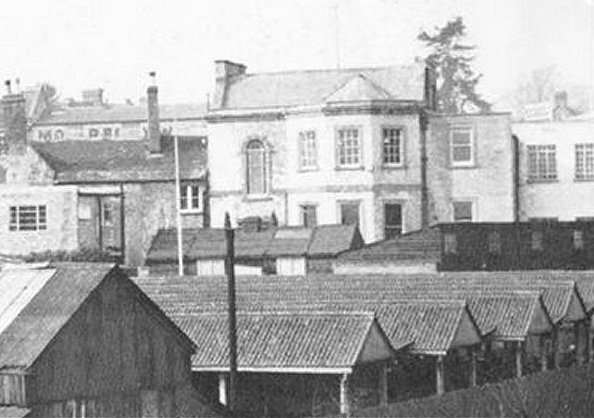 This photograph taken from Bide's Gardens of the northern end of Princes Street / southern end of Kingston most likely dates to the early 1920s, yet is probably one of the earliest of this location as witnessed by the building at far left, next to Mansion House and enlarged below, which pre-dates the later Vincent's (now Batten's) building on the corner of Court Ash (running off to the left) we are all so familiar with. 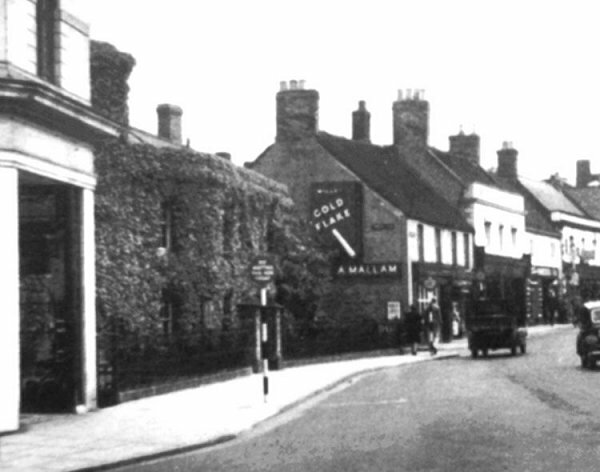 At right is the shop-front of the sales rooms of Hill & Boll's carriage works. An enlargement of part of the above photograph. The Mansion House photographed in the mid-1950's when it was completely covered in ivy. A sight that is never likely to be seen again due to modern buildings that now obscure this view of the Mansion House - seen across Fair Ground with its animal sheds, etc. Photographed from the bank by the Odeon Cinema in 1956. In my opinion the rear elevation of Mansion House is more impressive than the front elevation facing Princes Street. Mansion House and Magnolia House, photographed in 1990. Mansion House with the nineteenth century extension, now known as Magnolia House. The original house is at centre with a nineteenth century addition to the right (Magnolia House) and an early twentieth century addition at left. Shame about the modern replacement windows and ghastly glazing - what were they thinking? The rear of Mansion House displays some interesting features such as the dentilled cornice, fine window above the doorway (see next photo) and the simple doorway itself. Note the boot scraper at the top of the steps, by the doorway - one of only two I know of surviving in Yeovil. 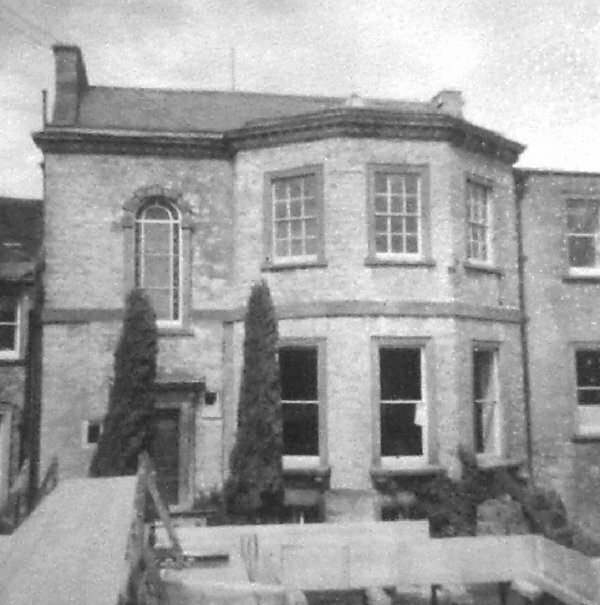 The rear elevation of Mansion House, photographed during restoration in the 1970s. 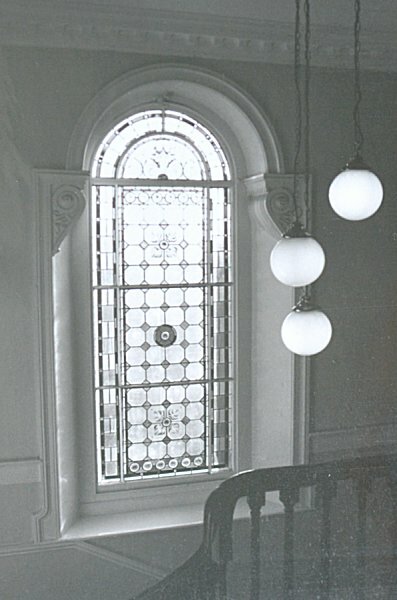 The window above the rear entrance door photographed during restoration works in the 1970s. 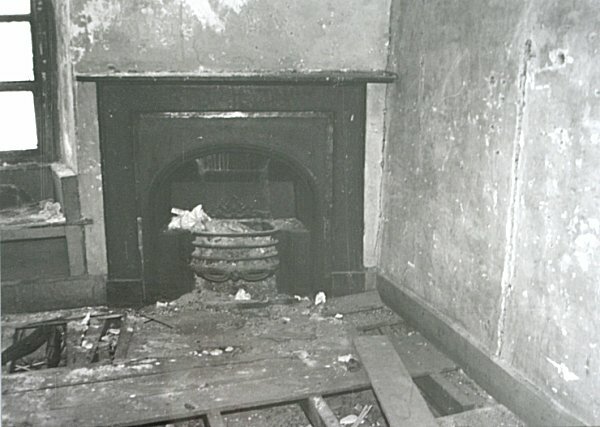 An old fireplace photographed during restoration works in the 1970s. 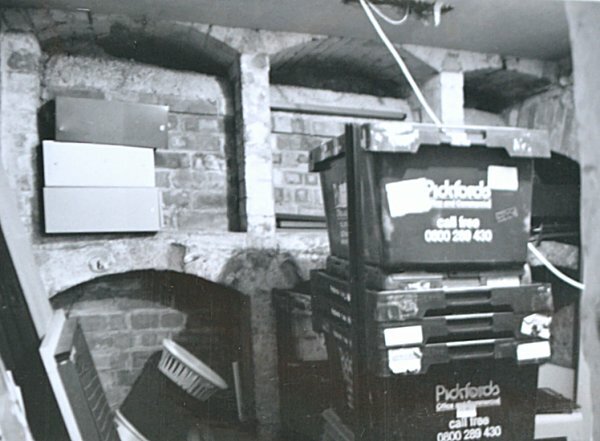 The wine cellar, photographed during restoration works in the 1970s. 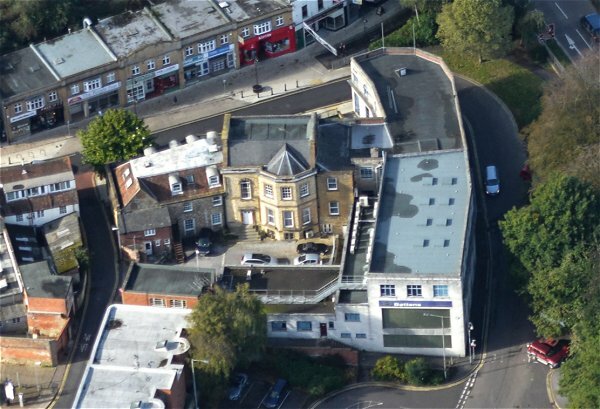 The back of the Mansion House (I think much more interesting than the Princes Street elevation) and the rest of Batten's ever-expanding empire in the former Vincent's car showrooms.